St. Thomas College Bhilai held the formal ceremony of Oath taking Ceremony on Saturday,10 September 2016 conferring the authority and responsibility to the office Bearers and other representatives of Student Union Council. The Chief Guest of the function was Mr. Devendra Yadav (Mayor, BMC). In his speech he congratulated the elected office bearers and advised them to take up their duties sincerely and with full commitment. He in his emphasized the elected members to understand the value of each single student and keep the relationship like father and son. Chairman of the college His. Grace. 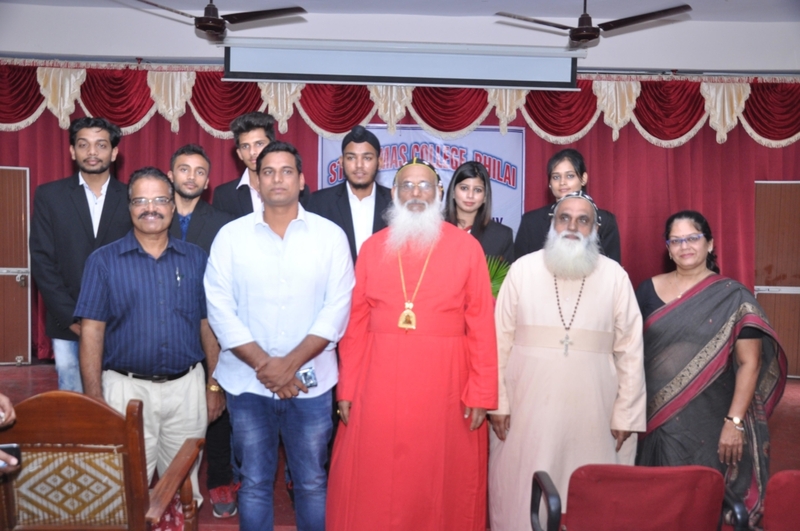 Dr. Joseph Mar Dionysius presided over the function, in his presidential address he congratulated and blessed the newly elected office bearers and Class representatives and said that they should uphold the values of the college and discharge their duties with utmost sincerity and honesty with proper team work and leadership quality and also maintain harmonious relationship between students and teachers. . Addressing the gathering Principal, Dr. M.G. Roymon in his speech congratulated the newly elected members and asked them to perform their duties and responsibilities sincerely and with full dedication. Professor Incharge. Dr Sapna Sharma extended her warm welcome by her motivational speech for the elected members. Principal Dr. M.G. Roymon administered the oath of secrecy to the newly elected office bearers and class representatives. Mr. Amanpreet Singh Rekhi was sworn in as the President of the college, he is also the elected Secretary in Durg University, Durg. Mr. Anurag Sharma – Sports Secretary. The volunteers of NCC/NSS and all other class representative also sworn in the oath. The other dignitaries present were Mr. Rang Bahadur Singh, (Parshad, Ruabandha, bhilai), Administrator of the college , V. Rev. Fr. George Mathew Ramban, Asst Prof Incharge of Student Council Dr. Shiny Mendonce , Mr. K.N Verma , staff members and students of the college. The program was successfully conducted by Dr. Susan Abraham and the President of Student Union Council -2016 . Mr Amanpreet Singh Rekhi proposed vote of thanks.